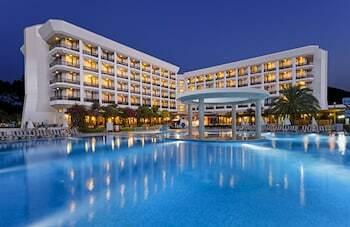 Located in Kemer, Ozkaymak Marina Hotel - All Inclusive is by the sea, within a 5-minute walk of Moonlight Beach and Park and Kemer Marina. Featured amenities include dry cleaning/laundry services, a 24-hour front desk, and luggage storage. Free self parking is available onsite. Located in Kas, this villa is a 1-minute drive from Cukurbag Peninsula and 7 minutes from Hellenistic Theatre.